To live with a dog is to have a sense of humor. 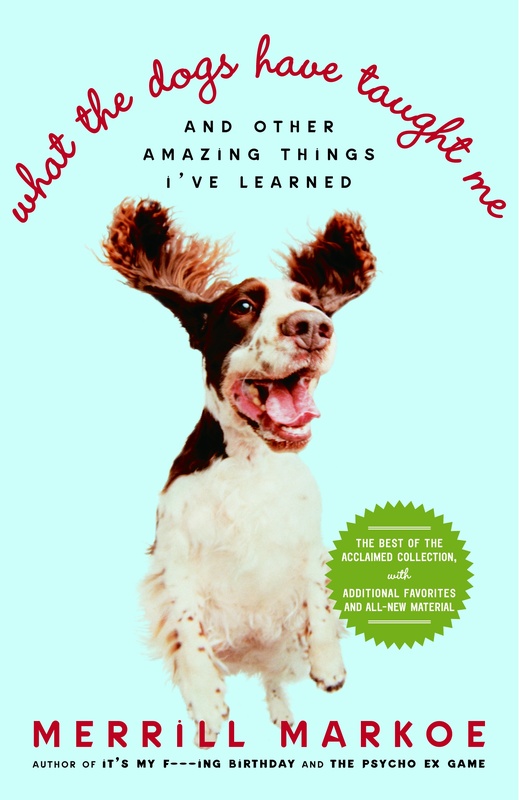 That is the recurring (and endlessly entertaining) theme of the recently reissued What the Dogs Have Taught Me: And Other Amazing Things I’ve Learned, by veteran comedy writer and Animal Planet’s “Who Gets the Dog?” judge Merrill Markoe. In the new foreword, Markoe updates her readers on how much has changed since the book was first published in 1992. And yet, her dog experiences – and her funny take on them -- are timeless. For example, she assures dog lovers everywhere that the ceaseless “joie de vivre” of our canine companions is attainable for humans, too. “All it takes is someone looking out for your health and your grooming while serving you nutritious meals plus vitamins every day as they selflessly make sure you get plenty of exercise and love and comfort,” observes Markoe. “It also helps if they pay all of your bills. A cross between a stand-up comedian and an opinionated, black-sheep aunt, Markoe knows how to tell a story and deliver a punchline. While some of the essays might come across as dated (Fabio who? ), her dark humor makes it worth reading. It doesn’t hurt that most of the essays are about dogs, and even when they shouldn’t be, she manages to include them anyway. What dog lover isn’t guilty of doing the same in day-to-day conversation? Case in point, in “My Romantic Dinner with Fabio,” Markoe went out with the romance superhero for a magazine assignment. During the meal, they’re supposed to discuss his latest business ventures, but instead, she asks about his Great Danes and they spend the rest of the evening talking about everything from noseprints to unconditional love. Speaking of the latter, Markoe details how her dogs’ devotion affect her life in ways to which all of us can relate or with which we can at least sympathize. In the intriguingly titled, “Showering with Your Dog,” she describes her guilt when leaving the house sans dog. If two or more dogs are left looking forlorn at the front door, it’s hard, but not nearly as difficult as just one lonely pup standing there. When her dog Bob passed away, she temporarily had one dog, Stan. The combination of Stan’s solitary form and “‘How can you do this to me?’ face ensured she would take him along. But now that he is the only dog, she starts to consider him to be a roommate, which requires comparable changes in lifestyle. Whereas before she would give Bob and Stan a bath by hosing them down in the backyard, she now feels compelled to bring Stan into the shower. Naturally, this requires several steps. However, wily dog that he is, Stan is hesitant to enter the tub. But he is no match for Markoe; “It’s a well-documented fact that only a minute amount of chicken skin can accumulate in the lower third of any area of the world before it will be joined by a dog.” Non-dog people would surely think she was crazy by now, but the rest of us can recall doing things far crazier in the name of our pooches. The difference between dog people and well, other people, is brilliantly demonstrated in “Something Extremely Important.” A good friend of Markoe’s comes over to break the horrible news that his wife, seemingly out of the blue, wants a divorce. As Markoe listens to her friend, her shepherd mix, Puppyboy, attempts his own brand of comfort: distraction. She continues the essay from Puppyboy’s perspective and it’s absolutely charming. Of course, when you love dogs, there are bound to be some difficult or sad times and Markoe’s humorous tone should never be mistaken for being glib. By the time you finish reading What the Dogs Have Taught Me, your mouth will hurt from laughing, your eyes will be red from crying, and your own dog memories will amuse and comfort you. Julia Kamysz Lane is the author of New Orleans for Dummies, 3rd Edition, which features dog-friendly travel advice. Email her at neworlanes@earthlink.net.